Home CDN , children , crafts , December , feature , holiday , holidays , homeschool , papercrafts , printables , US , worldwide December 18th - Freebies! -- The idea is to pick up the phone on December 18 and answer: Buddy the Elf, what's your favorite color? Use #AnswerThePhoneLikeBuddyTheElfDay to post on social media. So wear something green, pick up the phone, and celebrate Answer The Telephone Like Buddy The Elf Day! 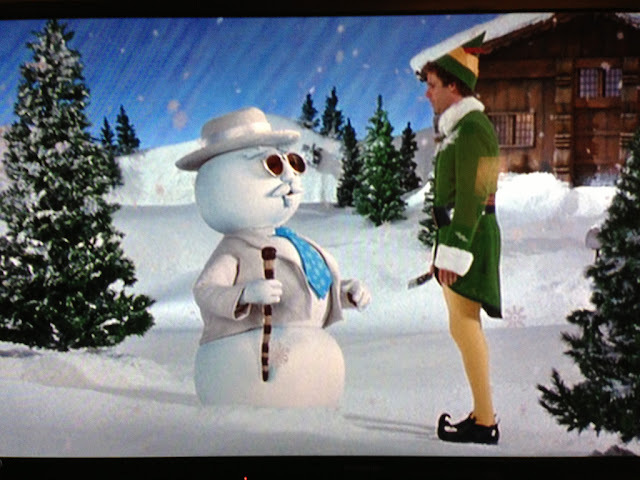 -- This is the story of Buddy Hobbs, an elf who feels a little out of place at the North Pole. The clumsy 6'2" elf is constantly banging his head on doorframes, beams, and cabinets, missing his toy-creating quota and is the only baritone in the elf choir. But what Buddy lacks in elfin abilities, he makes up for in Christmas cheer! Will Buddy's unique personality help him discover his true place in the real world? • Elf Movie -- One Christmas Eve a long time ago, a baby crawled into Santa's bag of toys Raised as an elf. Buddy goes looking for his true place in the world--in New York City. • Hallmark Talk Like an Elf microphone -- This magical toy will have you sounding like one of Santa's helpers no time! The voice-changing Talk Like an Elf microphone makes your voice sound wonderfully silly and squeaky, just like an elf. • The 'Elf' quiz: How much do you remember, buddy? - If you have ever thought to yourself, I wish there was a day I could wear a plunger on my head, and not get made fun of, then you are obviously a weirdo... But today your wish will come true. You will still get made fun of because c'mon, you are wearing a plunger on your head, but at least you will have an excuse. - This is a mid-December day to enjoy and remember. While everyone is running around, frantically preparing for the holidays, mom or grandma is busy in the kitchen. She has taken a break from the hubbub to cook a fancy meal.... a roasted suckling pig. As you read this, how many of you thought to yourselves.... Yeah, right... fat chance that will ever happen! - Bake Cookies Day comes at an opportune time. It is right amidst the major December holidays. It serves as a reminder to bake holiday cookies, if you haven't done so already. Young and old celebrate this day by baking their favorite cookies. Make a party of it, and bake cookies in groups with family, friends, kids and grandkids. - A fun day created to encourage us to take notice of snowflakes and to be mesmerized by each icy one which falls. - Recognizes the contributions millions of migrant workers make to the global economy and seeks to draw attention to the precarious state of their rights. - Sometimes you wonder where are all your friends when you need them? Or, maybe, you have focused on your business or career and have just a few friends you could find. You possibly also give all of yourself to your spouse and family leaving little time for friends. Well, if you would like more friends you can count on, you must be a friend first. - Thomas Fleet of Boston, Massachusetts, published his mother-in-law's tales in the book, Mother Goose on December 18, 1719. - This game was invented in December 1929 by Edwin S. Lowe. It has become a five-billion-dollar-a-year charitable fundraiser - plus given a lot of people hours of fun.